It would almost be better if Henry Ford made Caterhams – any colour as long as its black. 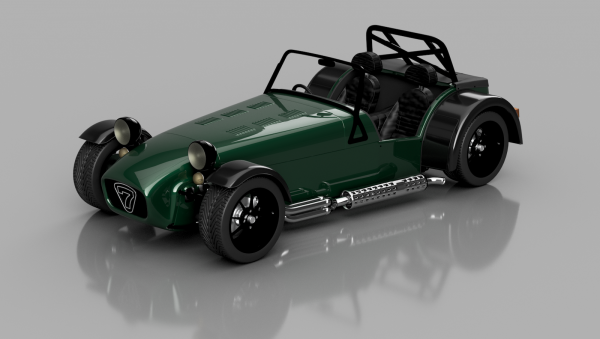 There are so many great Caterham colours. There’s the classic green, or the recently more popular Porsche blue. There’s yellows and reds. Decals. Single, double or triple stripes. The options are endless. Initial thinking was, at least for me, centering around Purple. With the Purplemeanie domain it seemed obvious. Then there’s the question of flat, metallic or flake. How to try all this out? Well as luck would have it I’m a bit of a geek (apparently) and I spend quite a bit of my time tinkering with 3D models – on PC screens, as 3D prints and 2.5D CNC projects. What I needed was a 3D model of a Caterham that I could change the colour of and test out some paint options without having to actually paint a real car. 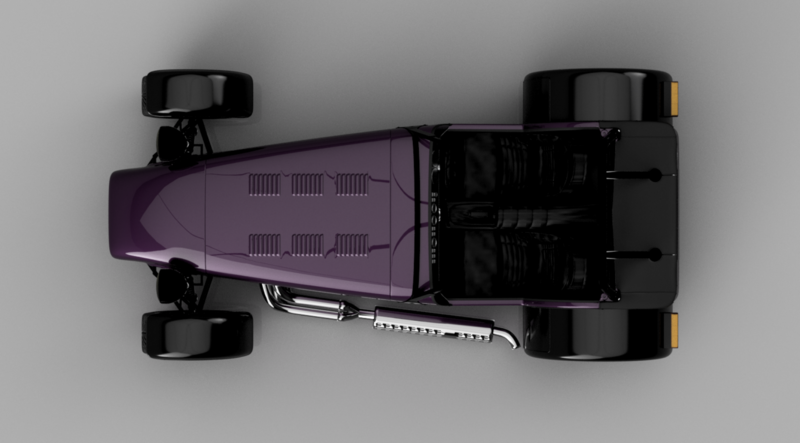 I did a bit of Googling and found a reasonable 3D model of a SuperSprint I think it is. It’s not quite the right model and the exhaust is on the wrong side (yes I know). But its good enough for the task at hand. There were a few other possible 3D models doing the rounds but many had aero screens and I wanted to model things with a windscreen. This model also had doors (no hood) so that gave some further options for seeing what colours would look like with and without doors. The rest of the models I found were clearly not realistic enough or weren’t available in the right file format – I tried a couple of free (as in beer, not as in spirit) models first but they didn’t import well into my CAD tool. The tool I’ve been using recently is Autodesk’s Fusion 360. For those interested its a cross platform Qt based application that sits in Autodesks semi-pro/pro-sumer space. It’s really well featured and semi-cloud based so I can work on it from various laptops or PC’s and offline. I like Fusion 360. I imported an .obj format model in Fusion and as far as I can tell the import was good. It has some scaling issues but I’m not worried about that for this project. By setting a custom colour I’ve been able to play around with colour options. I tried some yellows, reds, blues etc. But there are dozens of images of those sorts of cars (all nice cars) on the web and I didn’t need to go to all this trouble just to check them out. What I really wanted to do was try out some Purple variations and see what worked. So, I played around with a bunch of options in Fusion, some of which are below. To my taste the dark metallic purple’s are what works best for me – each to their own. Another job sorted… at least until we change our minds! 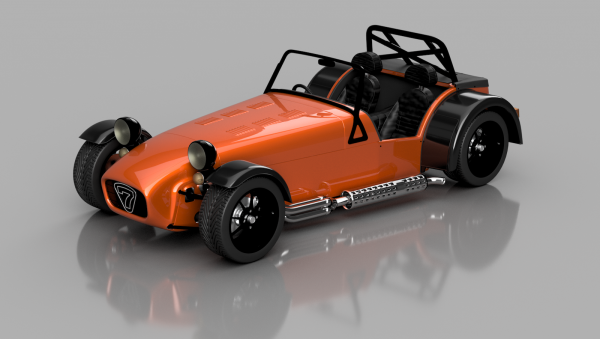 The images below were rendered using Fusion 360’s render tools. Lighting was set at 2000 lux.